Historic purchase • Draper completes the largest open space purchase on Wasatch Front. 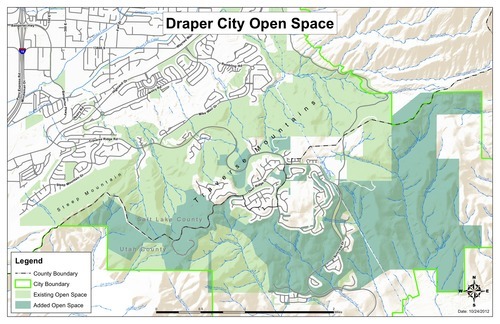 In a controversial decision to spend $5.6 million for open space, the city of Draper announced on Friday it had officially purchased about 2,400 acres of undeveloped land in the SunCrest subdivision from Zions Bank. The city now has more than 4,000 acres of open space. In 2005, it bought 1,800 acres in Corner Canyon, which is adjacent to the SunCrest acquisition. The purchase comes after the would-be buyer of the development, Arizona-based MCO, backed out in June, due mainly to conflicts with the city over open space requirements and public access to trailheads. SunCrest residents have raised concerns about how the purchase will impact them and what the new master plan will contain. But the mayor sees it as a boost for the city&apos;s quality of life. The purchase "is a very historic and important addition to Draper City&apos;s open space," Mayor Darrell H. Smith said in a news release. "Draper City looks forward to the planning process to determine the future use of this property and the city will be involving community members in this process." The city has not specified how it will fund the upkeep of roads on Traverse Ridge that lead to the open space. It originally planned to impose a Traverse Ridge Special Service District levy tax on SunCrest residents, which would have eventually lowered to zero, once the cost was spread among the additional 3,000 planned homes. Since the open space acquisition stops that construction, residents of the 1,100 existing homes wonder if the tax will ever go away. The city has said some of the cost of the land purchase will be covered by refinancing some city bonds, which saved them $125,000 a year and a total of $1.1 million over the life of the bonds. To pay the remaining $4.5 million of the open space bond, the city plans to re-allocate money from its capital projects fund, said Finance Director Danyce Steck. "There will be no increase in [property] taxes," she said. R&B SunCrest LLC developers backed out of the SunCrest purchase after Draper City demanded the developer reconstruct Deer Ridge Drive and install a $2.7 million water tank. Zions Bank sued Draper City for $25 million, alleging the city forced the SunCrest development into bankruptcy, which led to Zions Bank buying the property. A settlement was reached and Draper agreed to maintain the roads and address water supply issues. MCO then tried to buy the property, but backed out when the city rejected its open space plan. Most recently, Zions Bank had invited the city to buy the property.